Turnips are low in calories, with just 34 in a cup of cooked turnips, and they provide significant amounts of fiber, with 3.1 grams per cup, or 12 percent of the daily value. They only provide small amounts of most vitamins and minerals, however, with the exception of vitamin C.
A 1-cup serving of cooked turnips has 18.1 milligrams of vitamin C, or 30 percent of the DV. The same-sized serving of raw turnips contains 27.3 milligrams of vitamin C, or 46 percent of the DV. Vitamin C plays a role in immune function and the metabolism of protein, helps to form collagen and heal wounds, improves the absorption of iron from plant foods and acts as an antioxidant to limit cell damage. 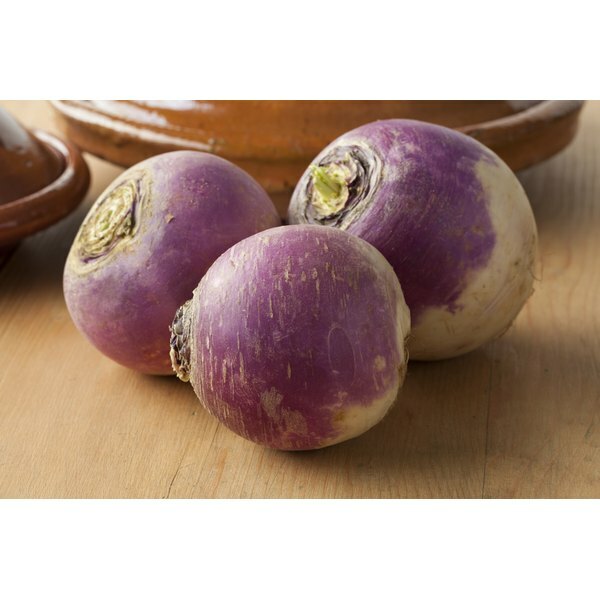 Turnips also contain small amounts of the B vitamins thiamine, riboflavin, folate, niacin, pantothenic acid and B-6. These B vitamins are essential for your brain and nervous system to function properly.